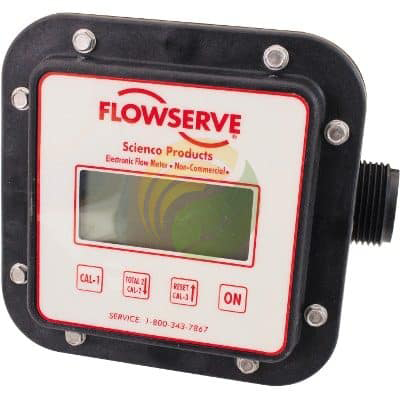 With the largest LCD display available on the market, large positive touch buttons and simple one-touch operation, FlowServe flow meters are easy to read and to use. The FlowServe SEM-10, SEM-10FT, SEM-10SS electronic flow meters employ positive displacement nutating disk technology to meter liquids of various viscosities with great accuracy and nominal pressure loss. With the largest LCD display available on the market, large positive touch buttons and simple one-touch operation, FlowServe flow meters are easy to read and to use. The SEM-10SS model offers a stainless steel and plastic construction and provides increased resistance to corrosion. This multiple use non-commercial meter mounts directly to the pump discharge via a one-inch stainless steel rear port and may be used with many pesticides, chemicals and petroleum products.